Leave a comment in the 'Notes' box if you any special instructions. If you have trouble purchasing a Digital Download, click the 'billing information same as shipping' box. If you still have problems, email lornabethgoldsmith@gmail.com. 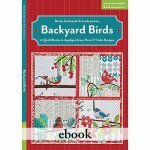 You'll want to make all 12 of the endearing blocks featuring robins, cardinals, orioles, nuthatches, and other favorite feathered friends from the back yard. These blocks are bursting with fresh colors and are easy enough to be fun for quilters of all levels. 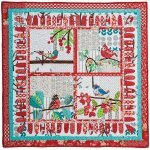 Included arr 12 easy appliqué blocks to mix and match, or sew them all to make a 52” x 65” quilt with appliqué borders. 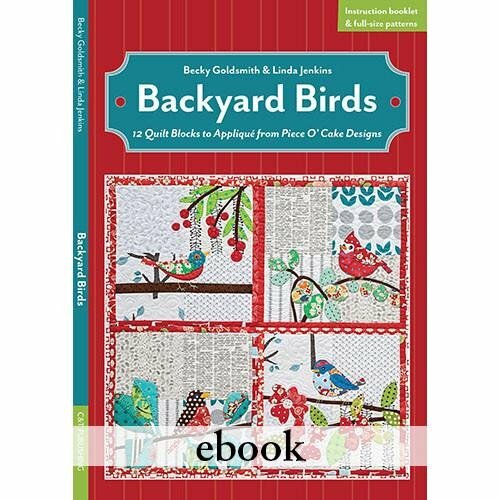 Also included are instructions for a 4 block 39'' x 39'' quilt (shown on the cover). Digital Downloads are delivered directly to your computer as PDF files that you can save and print on your own printer. You will receive an email with a link once your order has been processed. This may take 24 hours, depending on when you place your order. If you have questions or problems, email me (becky.pieceocake@gmail.com) and I’ll fix the problem as soon as I can. Always print your patterns at actual size. If you are unsure about how to do that, click here to read a blog post with detailed information about printer settings.